Extreme lack of attention is not unusual in hospitals in poor countries, says Martin Onyango, legal advisor for the Center for Reproductive Rights based in Nairobi. When Josephine Majani came to, she was on a hard hallway floor in the Bungoma District Hospital in Bungoma, Kenya. Majani has no memory of being slapped, she says, but when she regained consciousness her cheeks stung. She did as she was told. She struggled to her feet and followed nurses back to the room to deliver the placenta. This was in August 2013. Eight years earlier, she had safely delivered a girl at home. Then four years before, she gave birth to a boy at a hospital. "It was good, clean care. I had assistance. It was a good experience," she says of that delivery. Her third baby had been overdue — so three days before his birth, she went to the hospital. She was given medication to induce labor. As her labor progressed, she found herself on her own. "There were no attendants, no one to assist me," she says. "I called for help, and no one ever came. I got out of bed to find someone to help me. I was in the hall, and I fell on the floor. I was unconscious." That's when the baby came. This extreme lack of attention is not unusual in hospitals in poor countries, says Martin Onyango, the senior Africa legal advisor for the Center for Reproductive Rights based in Nairobi. "This is a systemic problem in Kenya," he says. Onyango is Majani's attorney in a landmark case against the hospital. What was unusual was that a hospital intern captured it all on video: the mother and newborn on the floor, the slaps, the verbal abuse, the public humiliation. The video fell into the hands of a Kenyan journalist. It ran on television programming nationally in Kenya — and went viral not long after the incident. "We got to know of Josephine's case because we saw it on TV," Onyango says. More than four years later, in February, the court issued a landmark ruling awarding Majani $25,000 (2.5 million Kenyan shillings) in damages, requiring that hospital staff formally apologize to her and setting a precedent that demands women be given quality care and treated with dignity during childbirth. "The court ruled that nothing excuses behavior that is so degrading to a woman, a human being," Onyango says. Dr. Harshad Sanghvi is chief medical officer of Jhpiego, a group that works in 40 countries to improve health care for women and families. "What happened to this lady is unfortunately all too common," says Sanghvi, a Kenyan who formerly headed up the University of Nairobi Hospital. "I recently visited a hospital in western Kenya. They are equipped for 10 to 15 births a month. But they're doing almost 300 births a month. You can imagine the overcrowding, the shortage of supplies." Such conditions can be fatal. 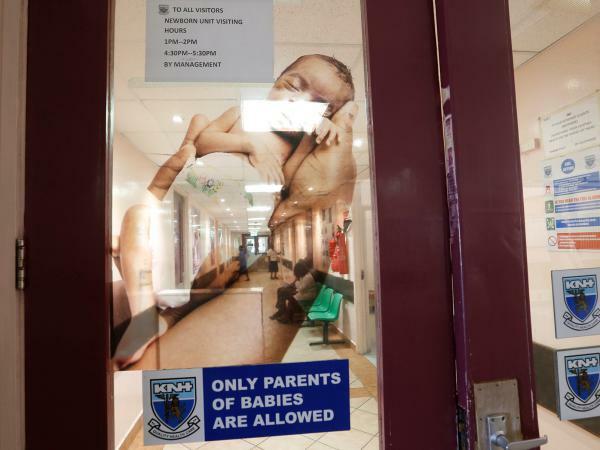 A report released by the Kenya government in February found that of 484 maternal deaths in Kenyan hospitals studied in 2014, 90 percent were the result of substandard care. According to statistics reported by the CIA, Kenya has the 19th highest rate of maternal mortality among 184 countries studied — with 510 deaths per 100,000 births. Finland, Poland, Iceland and Greece are the safest countries to give birth in, with 3 deaths per 100,000 births. The United States ranks 138th with 14 maternal deaths per 100,000 births. But Peter Johnson, senior director for nursing and midwifery at Jhpiego, says most people go into health care, nursing or midwifery because they sincerely want to help people in need. He has seen people he calls heroes and saints delivering maternity care under the most difficult circumstances. "Nobody wants to be mean. They want to make a difference," Johnson says. "But these folks can work under horrendous conditions. I've been in labor wards in India where I've watched midwives kick rats out of the way to get to the woman." Midwives in poor countries are not always trained as thoroughly as they are in the developed world, Sanghvi says. And often, because they are usually women in places with great gender inequality, they are not respected. Add to that overcrowded conditions and lack of supplies and resources, and nurses and midwives can feel enormous pressure to move women along during labor. "Providers can be in a state of panic," Sanghvi says. "Under those conditions, mothers will get pushed, slapped, verbally abused, partly because of the provider's panic." When nurses and midwives see the abuse in their training, they copy the behavior, and the cycle of abuse continues, he says. "We need to fix how people are being trained." Sanghvi looks to a program he worked on in Afghanistan as a model for how to develop a system of maternity care. "Midwifery schools were wiped out. We needed to completely revamp them," he says. "We wanted to empower midwives to be full professionals. We taught them computer skills. We taught them English so they could read the medical literature. It has paid off tremendously. They are extremely competent." Another program in Mozambique has encouraged mothers to ask for a companion— a husband, mother, sister or friend — to accompany them in the hospital through labor and delivery. Such so-called companionship programs have been shown to improve the quality of care in hospitals, according to a February World Health Organization report, Intrapartum Care for a Positive Childbirth Experience. "Fifteen years ago, the level of companionship was essentially zero," Sanghvi says. "As of a year ago, 58 percent of mothers in Mozambique now have a companion." "Everyone, even poor people, have cell phones in Kenya. We told mothers they would receive a text message survey when they got home. We asked: Was it clean? Were they treated with kindness? Were they scolded? We showed the results to the hospital. And they took action. If we told them that 26 percent of patients said they did not receive privacy, they took action. It's hard, because of overcrowding, but they started putting up curtains." The Center for Reproductive Health, along with Jhpiego, are part of an international movement to improve the birth experience most recently exemplified by the WHO recommendations on childbirth, Sanghvi says. "Those guidelines are unique," he says. "They focused not just on hard science, but on what women themselves want in their childbirth experience." "I've worked in the city of Baltimore as a midwife for many years. I've seen some of the same phenomena — people living under chronic stress; nurses, midwives and physicians working under difficult circumstances; a feeling of bad chemistry, bad communication; women being induced before they're ready; withholding water if they're thirsty, or food if they're hungry; not letting them out of bed to walk around so they can be more comfortable. These are things that we're promoting globally, but we don't always promote it here in the U.S."
Maternity care may be changing at a glacial pace, but Majani is proud that her horrendous experience has helped move the needle toward better care. "I just know this is going to be a lesson to all the clinical attendants who perform their work in maternal health care," she says. "They are going to serve the people equally. They are going to be loving and perform their work with kindness."